To say that my dad is a major baseball fan would be putting it lightly. And it took until kiddo #6, but my dad finally got himself a serious baseball player. Even though he's only 8, Owen is quite the little slugger. I went to a few of his games this year and it was so fun to see him get into "game mode." Owen is really good at listening to his coach (who happened to be my dad this year) and making necessary adjustments. And like any other player, he dreams of hitting home runs. There was one game in particular when he was especially determined to hit the ball all the way into the outfield. My mom and I were sitting in the bleachers keeping score, and Owen ran to us from the dugout exclaiming, "This is it! I'm going to hit a home run this time!" His age group plays with a machine pitcher and it had been having some problems that night. The pitches were unpredictable and the kiddos were having a hard time hitting the ball at all. Some balls came high over the batter's head, others rolled across the plate. Some came at a wicked speed and others seemed suspended in air. But Owen was determined and he went right up to home plate and began his pre-batting ritual. He was even wearing his batting glove so he was ready to go. He got into the correct position and then came that first pitch. He had a great swing, but the machine sent him a crazy pitch and he missed. Immediately he looked to my dad. "It's okay. Scoot back a little bit." My dad helped him get into the correct position and then sent the next ball. Another swing, and another miss. And again, Owen's eyes went straight to my dad. "It's okay, get ready for the next one." Owen did that little hop he always does to get his feet in the right spots and got ready for the next ball. And he missed for a third time. Owen's age group is allowed 5 pitches, but I could tell he was getting nervous. He looked again to my dad, who helped him get his hands on the right spot on the bat. The 4th pitch came and went. The pitches were all over the place and though he was close, Owen just couldn't hit the ball. "Last pitch, buddy. Make it count!" Owen did everything he could. He made sure he was standing correctly and that his grip on the bat was right. He looked at my dad one last time and then locked his eyes on the pitching machine. The ball came and he swung. He walked back to the dugout and it was easy to see that he felt defeated. He had walked to that plate with such high hopes of hitting that home run. And not only did he not score a run, he didn't even hit the ball. Sometimes I go into a situation ready to hit a home run. But I swing, and I miss. And so many times, I don't even hit the ball. But the important thing is to do exactly what Owen did and immediately look to my Father. Just like my dad did, Heavenly Father can tell us what adjustments we need to make in order to be prepared to hit the next ball. And even if we miss, He cares that we're trying. He doesn't expect us to hit a home run every time. He doesn't even expect us to hit the ball every time. As long as we keep looking to Him, and make the adjustments He instructs us to, someday we're going to hit that home run. I'll always remember the summer of 2008 as the time my parents decided to completely remodel our house. We knocked down every wall in the whole house except for one. I remember using a sledgehammer to help take out the tile in the kitchen. And climbing on the rebar sticking out of the new cement. I remember the craziness of all the kiddos sharing a room and my mom having a baby in the middle of the process. But probably the most important thing I remember happened when my dad and I installed the new washing machine. We worked together to get it lined up and then leaned together to shove it into place. As we got a few inches away from the wall, I swear I watched in slow motion as a screwdriver rolled off of the window ledge and fell behind the washing machine just as we finished pushing it into place. So here we are 10 years later and that screwdriver is still there. I've thought about that experience a lot and I've reached this conclusion: the screwdriver isn't doing anybody any good by hiding behind the washing machine. Sometimes I feel like I "hide behind a washing machine" and don't allow God to use me as the tool I could be. Because here's the thing: God is not a tool on my tool belt. I am a tool on God's tool belt. DON'T HIDE BEHIND A WASHING MACHINE! God can use you and will use you if you let Him. The quote below is long, but it is one of my very, very favorites! I love this quote so much and agree 100%! Everyone has a contribution to make. If you haven't figured out what your individual talents are, ask God and ask those around you! One of our greatest collective weaknesses is our lack of faith in ourselves. Too often, we fail to see our tremendous worth. That simply won't do. God needs us to be everything we can be! 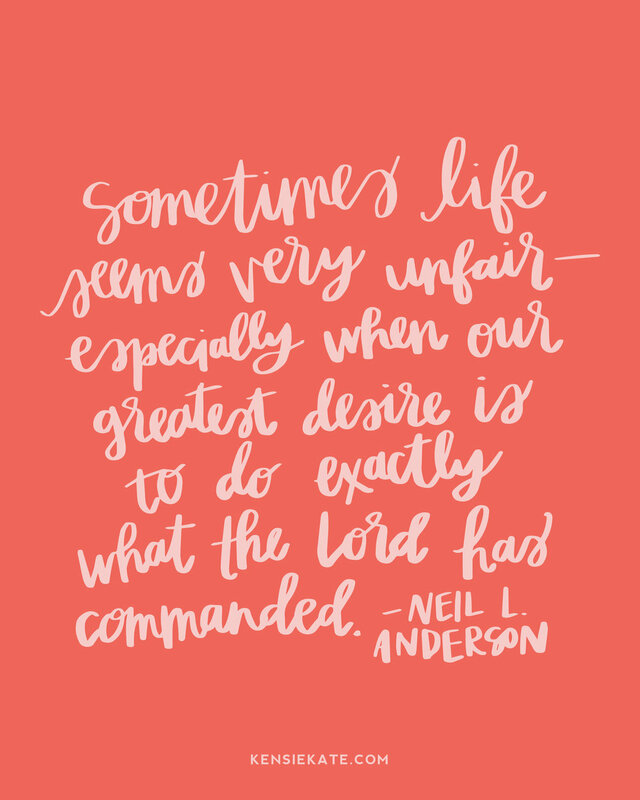 The Atonement doesn't just allow us to repent and be forgiven, but it also enables us, strengthens us, and gives us a desire and power to serve beyond our natural capacity. Being a tool on God's tool belt means that we allow Him to use us in ways we never thought possible. It means that we go to sleep each night knowing that our talents and unique abilities were used in a way to bless others. Being a tool on His tool belt means that we are never alone or expected to do things on our own. If you do all that you can with the talents and abilities God has given you and pray for help and guidance, He will reach out and take you by the hand. He will use you. 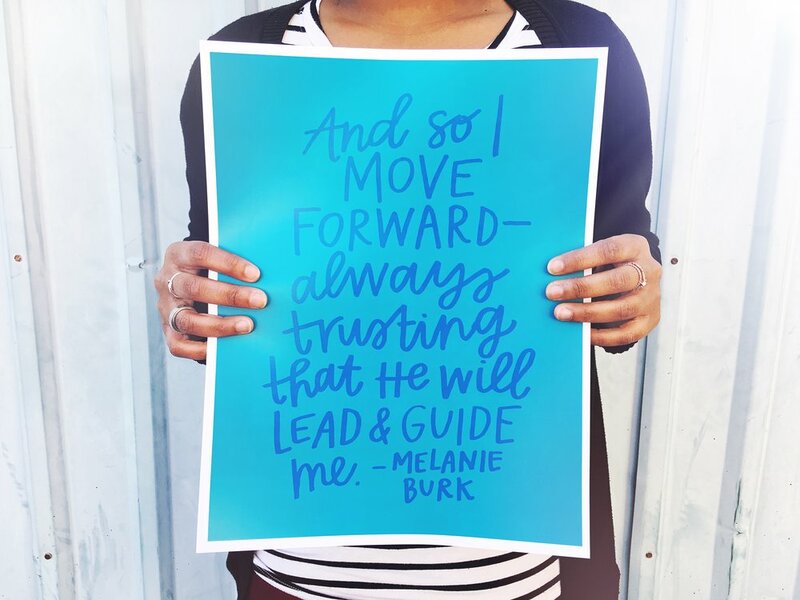 If you give your heart to Him and allow yourself to be led, He will use you. He will use you in ways you can't even imagine right now. And He will bless you in ways you can't even imagine right now. Since the beginning of time, God has used average people like you and me to do His work. He doesn't need you to be mighty, brilliant, fashionable, eloquent, or wealthy. He only needs you to allow yourself to be used. No tool on God's tool belt is ever forgotten and each has a use. Choose to be useful to Him instead of hiding behind a washing machine! 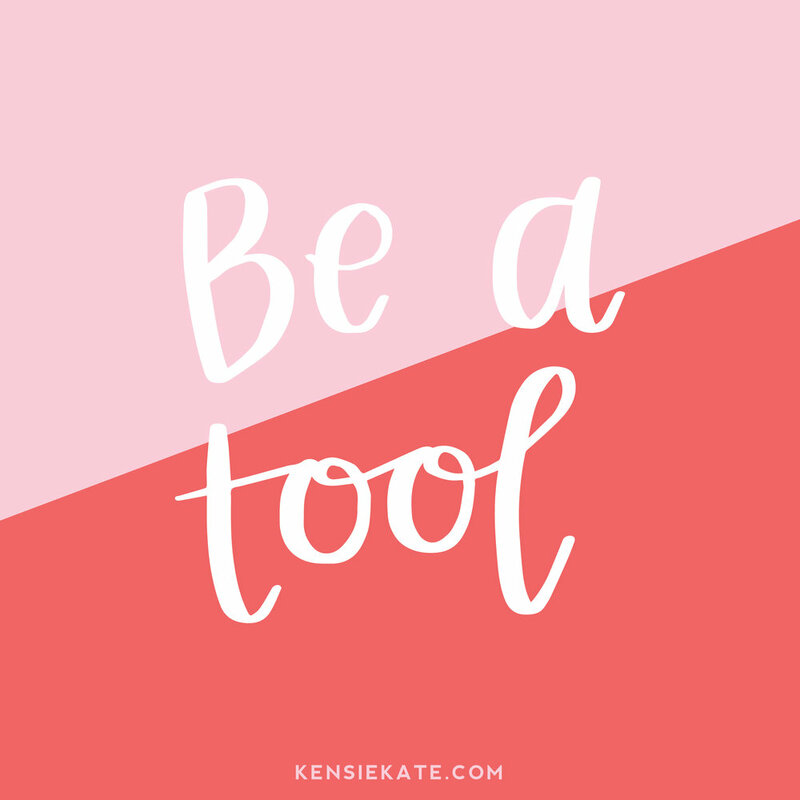 Be a tool. Not in the worldly way, but in God's way. I was probably 13 when I got a gift card for a local frozen yogurt shop. My family doesn't really frequent frozen yogurt shops that often. One time, we went and a certain child decided to test the limits of the paper container and fill it with practically every topping available. (I'm looking at you, Ainsley.) Nevertheless, I kept that gift card in my wallet at all times, waiting for the right moment to use it. A few years went by and the gift card remained in my wallet. I don't know when it happened, but one day I realized that the frozen yogurt shop didn't even exist anymore. The gift card was probably only worth $5, but it taught me an important lesson about waiting too long. Planning is important and I'm not advocating rash decisions, but sometimes I think we have a tendency to put things off. We plan for so long and sometimes we wait too long. One of 2 things happen: we let fear and uncertainty hold us back or we fail to properly plan. I just graduated from college so I've answered the "what are going to do now?" question about a million and one times. And here's what I've learned: I don't have to have it all figured out or have my whole career mapped out. I simply need to choose something that interests me, allows me to be constructive, and provides opportunities to serve others. As I move forward and gain experience, more doors will open—doors I don't even know exist right now. As we make choices and move forward with those choices, we will be blessed and new opportunities will be opened to us. We can't wait to "feel ready" because that moment will probably never come. We might feel some trepidation, but we have to exercise faith when fear would be easier. As we move forward and make good decisions, we will be guided to good opportunities. But if we sit and worry, we will end up missing opportunities that are along our way. A few months ago, I was walking home and I what did I see in front of me? A huge cardboard box, at least 7 feet tall. Immediately I started dreaming up all the things I could do with this cardboard box and I awkwardly carried/dragged it home. I had big dreams for what I could do and I just needed to decide on the best idea. I wanted to make a giant Christmas tree for our living room, but then Christmas came and went. I thought about making a castle, a photo backdrop, a fort, or giant 3D letters. The box remained between my bed and the wall for months and I would often stare at it and try to figure out what wonderful thing I would create. And then things got crazy busy and the next thing I new, the semester ended. It was time to move out, and since there was no way the box would fit in a car, I had no choice but to put the box back in the recycle area where I had found it 6 months before. I had big dreams for this box, but I failed to turn those dreams into a plan and time ran out. Don't let the "gift card" expire. What's something you've been putting off, either because you're afraid or because you haven't made the time? 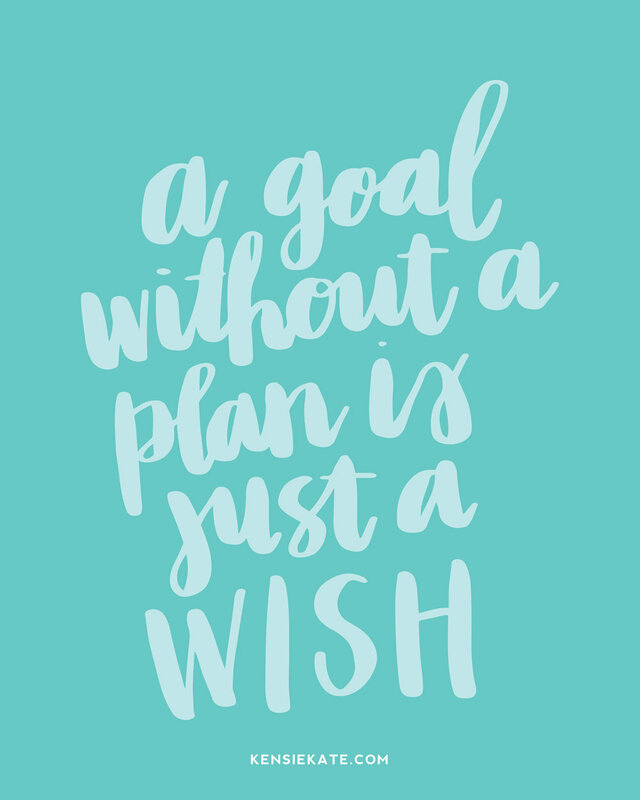 If it's really important to you, make a plan (with a deadline!) and let your faith be stronger than your fear. 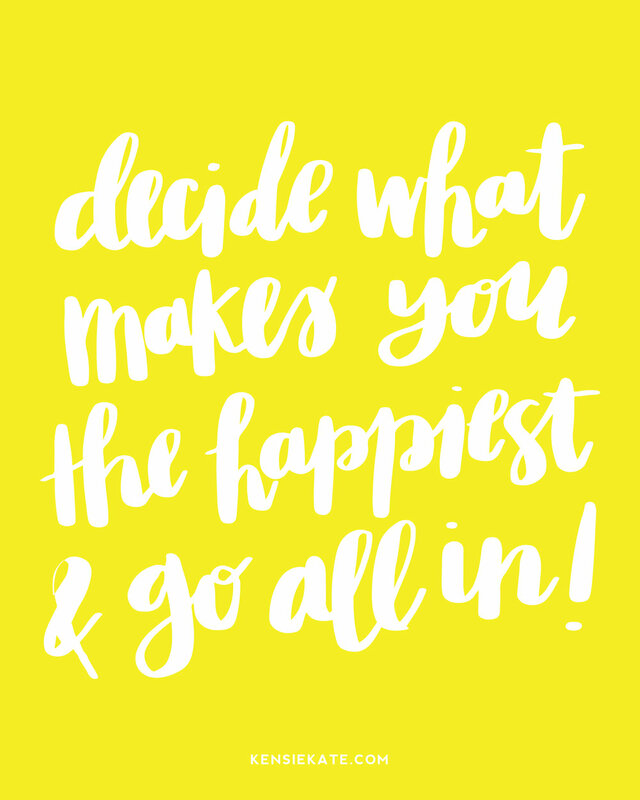 Decide what makes you the happiest and then go all in! I wrote a whole post about serving a mission even though I didn't want to, but this is the story of what happened after that. I'll warn you now, it's long, but there's a point :) The day I went to the MTC was hard (I cried at the drop-off and it took 4 people to pry Owen off my leg so I could leave), but I was fine pretty much as soon as I walked into the first MTC building. My decision was made and I was determined to make the most out of the experience of serving a mission. I loved my companion and worked hard in the MTC. After 13 days spent absorbing more than I thought was humanly possible, we flew out to Philadelphia. My trainer and I opened up a brand new area and we were the first sisters to serve in right in the city in who knows how long. Our apartment was completely empty (it took a couple of weeks to even get beds) and I wasn't sure I was still in America. We worked hard and tried to meet as many people as we could. I had been in the city for about 5 weeks (so almost at the end of my first transfer) when I started feeling sick. I thought it was just low blood sugar, which I already knew I had, but after talking to the mission nurse and trying a few different things without success, I went to the doctor. The blood work came back normal and so they started looking at my heart. There were no answers and I was getting sicker and sicker. It was really hard to be an effective missionary when so much time was spent on getting me better. I kept declining until I was passing out 20 times a day. Weeks had gone by and countless tests had been performed with no definitive answers. The week of Thanksgiving, I remember getting a blessing from my district leader (who I went to high school with). During the blessing, I kept asking Heavenly Father the same questions, "What do I need to do to get better so I can focus on being a missionary?" "What doctor do I need to see next?" "What do you need me to do?" I didn't seem to be getting any answers and eventually I stopped asking those questions. Instead I asked, "Heavenly Father, am I going home?" Immediately I got my answer, "Yes. But not yet. I still need you here, but be prepared." I was crushed. I hadn't even considered going home until that point. I thought that surely the doctors would figure out the problem, tell me how to fix it, and I would be back to normal. Even though I spent so many months not wanting to serve a mission, all I wanted at that time was to feel better so that I could finish the rest of my mission. A few more weeks went by, more tests were performed, and I was getting used to being sick all the time. I got permission to go to bed an hour early each night, but that was the only real change to our schedule, besides the doctor's visits. I was still doing everything that a missionary does. I got to talk to my family on Christmas Day and at the end of the conversation, my parents asked me if I was coming home. I told them it hadn't even been discussed yet, which was true, even though I knew from that blessing that I would eventually. Then seemingly randomly, the mission doctor called me and told me that he had just recommended to my mission president that I be sent home. Had I not received that answer during that blessing weeks before, I would have been caught so off guard, but Heavenly Father had prepared me. As much as I didn't want to leave, I felt that it was the right call. 2 days later, I was on a plane to Salt Lake City. The plan was to be home for a couple of weeks. During that time, I would be able to focus 100% on getting better, without having to juggle missionary responsibilities. I went to the cardiologist that my uncle sees and we were able to learn pretty quickly that I have the same heart condition as my uncle. I found out it would be at least a couple of months before I would be able to return. I got home January 1st and by April, I was ready to resubmit my papers to Salt Lake for approval to return to Philadelphia. I had been cleared by my cardiologist, and I just needed Salt Lake to be on board. But every time I moved forward, something didn't feel right. My anxiety increased but I pushed it to the side, much like I had when I knew I was supposed to serve a mission but didn't want to. The plan had been simple: Go home, get better, go back. That had been the plan for 4 months so I didn't really stop to question it. 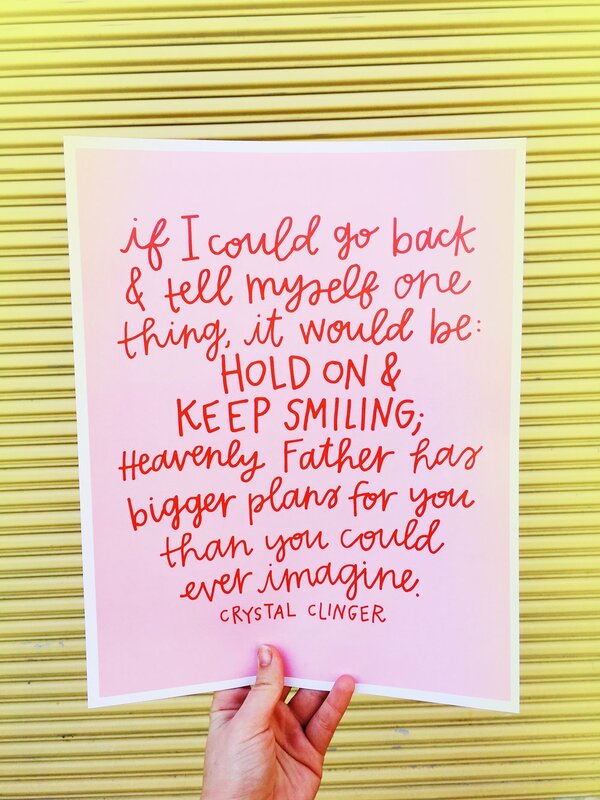 Finally I realized that I needed to pray to see if that was still Heavenly Father's plan for me. When I prayed, I felt like I wasn't supposed to go back and I was so confused. 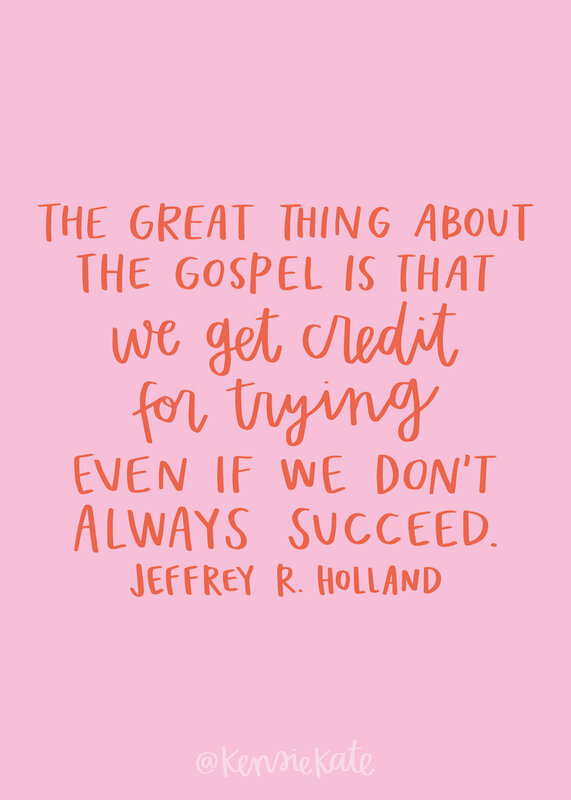 I hadn't wanted to go at all in the beginning, but Heavenly Father had softened my heart and then all I wanted was to be a good missionary and finish my mission. I was hurt. I wondered if Heavenly Father didn't think I was a good enough missionary. If He thought I was too broken. I had been hit with what felt like this huge "NO!" from Heavenly Father and I didn't know what was next. All I wanted to do was exactly what I thought Heavenly Father wanted me to do--be a dedicated missionary that He could count on. But that big fat "NO!" turned out to be one of the biggest blessings. Because God's "no" is actually a "I have something better in mind." I'll be honest, I didn't really accomplish a whole lot in those next few months. I was trying to figure out what God's "something better in mind" was, but mostly I was directionless. 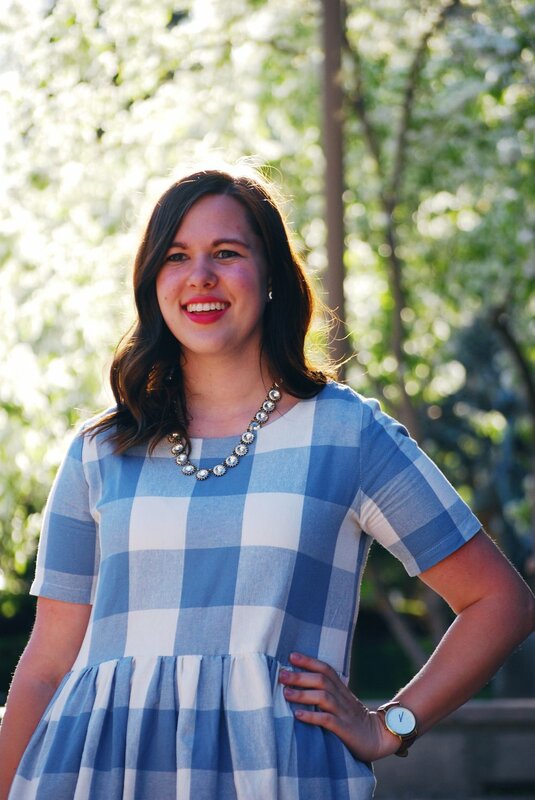 I started BYU again that fall and THANK GOODNESS! If I hadn't gone that semester, I wouldn't have made the lifelong friends that I did, I wouldn't have had my 2 favorite jobs (Resident Assistant and EFY Counselor), and I wouldn't have learned all the lessons that I did at BYU that year. 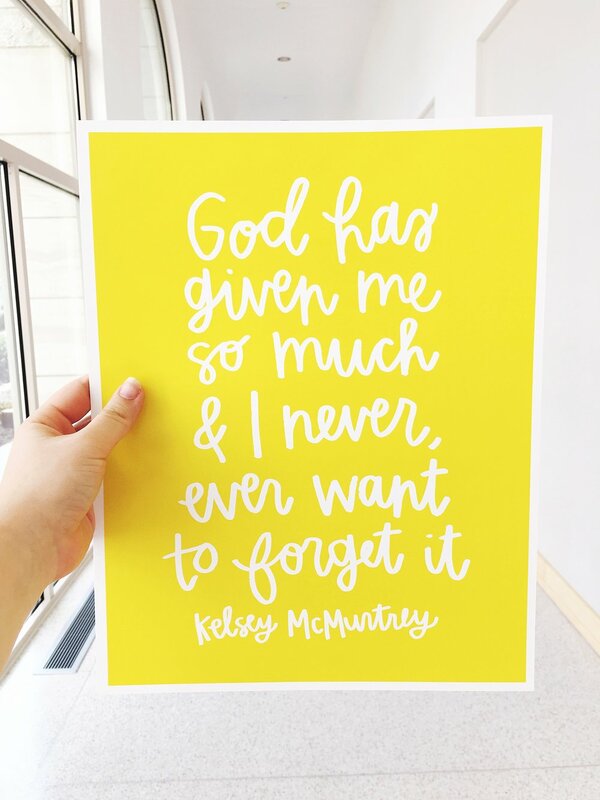 Yes, there are undoubtedly things that I would have learned by being a missionary during those months, but I grew so much that year as I tried to figure out what God's "something better" was. I have been able to share the gospel in so many untraditional ways that a full-time missionary can't. Heavenly Father helped me figure out how to serve a mission in the way that He needed me to. This was really long and if you made it to the end, you're a real champ! But the point is that if you ever felt like God has dealt you a big fat "no," I guarantee you it's because He was something better in mind. Hey guess what?! 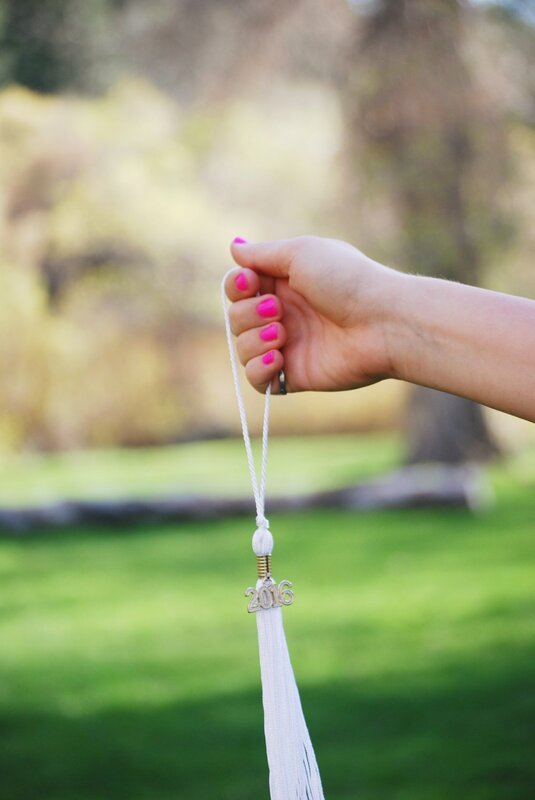 I'm graduating this week! It doesn't quite feel real yet, but I've spent a lot of time thinking about all that I've learned and experienced these last 4 years. It's been a long road, but the ups have definitely outweighed the downs! I couldn't tell you one thing I remember from Greek and Roman Literature if all the happiness in the world depended on it. I don't remember a thing from Astronomy. And I don't know when I'll ever find 20th Century Art and Theory useful, but I could go on for hours about all the things I learned from sitting in a hallway outside my apartment at midnight. Or really from any seemingly small moment where I was just talking to people. Those are the experiences that taught me who I am and who I want to be. What I value and what I want to do. Don't get me wrong, I learned a lot from my classes and tried a lot of things I wouldn't have otherwise experienced, but I feel like sometimes college students place too much emphasis on success in classes and miss opportunities to learn more important things outside of a classroom. Every semester brought new trials that I never imagined going through. My mom getting diagnosed with cancer. Passing out several times everyday. Getting severely concussed. One of my best friends passing away. The only way I made it through is because of the people I surrounded myself with. I've heard that you become like the 5 people you spend the most time with. I sure hope that's true, because they are pretty incredible. Surrounding myself with such good examples pushed me to do more and be better because of their influence. I don't think I can stress this enough. Yes, I understand that doing well in school is important and that your grades can affect your scholarship, applying for your program, or grad school, but people will always matter more. School eventually ends, but people will always matter. I have never regretted prioritizing people over an assignment. I remember talking to my mom once last semester about how worried I was about my grades and doing well enough. In typical mom fashion, she asked me, "did you do your best to be there for the people who needed you this week?" I had, and that's when I stopped worrying because I care so much more about people than some number called my GPA. When 22309532 things are demanding your attention at the same time, you have to figure out what matters most. You are awesome, but you can't do it all. It can be really easy to get to the end of the day and be dismayed by all the things that remain on your to-do list, but I think we all need to give ourselves more credit for the many things we do get done. I'm really good at listing all the things I could/should be doing so I started choosing 3 things a day. If I accomplish more than that, well then that's great. But if not, I can feel good about having 3 less things to do the next day. Most of my college experience has been impacted by the people around me. I am surrounded by so many amazing examples. But here's the thing: just because somebody awesome is doing something awesome doesn't mean I have to do that thing to be awesome. This kind of goes back to the idea of "you can do anything but not everything" but there are so many wonderful things to do and you have to do the things that are the most you. I am a big believer that you are the happiest when you are the you-est. I have had so many wonderful experiences and I have mostly loved these last few years. But it is not all sunshine and rainbows. You will not love every class. You will not get along perfectly with every roommate. You will never feel like you are getting enough sleep. You will consider giving up about 20397539 times, but that's okay. There are so many good things that will happen, I just think that it's important to remember that there will be days when you don't want to do anything except for eat popsicles and watch How I Met Your Mother. I used to think college students were so old. Surely by the time I graduated, I would know what the heck I was doing, but *News Flash* I am winging it every single day. But so is everyone else. Yes we are adults and expected to make decisions that sound entirely too grown up, but we're all just figuring it out a little at a time. It doesn't matter how well your parents prepared you to live on your own, you will still feel like you don't know what you're doing with your life. It's fine. Sometimes it can be really hard to get caught up in the constant stream of endless deadlines. But it will eventually end. And as long as you work hard and are kind, everything will work out. I have loved so many things about being a student at BYU, but probably my most favorite thing that I wouldn't have experienced anywhere else is how much the Gospel ties into every subject, not just religion classes. Persuasive Writing, Medieval Art History, Astronomy, Sculpture, Biology. They all relate to the Gospel and I've loved making those connections. 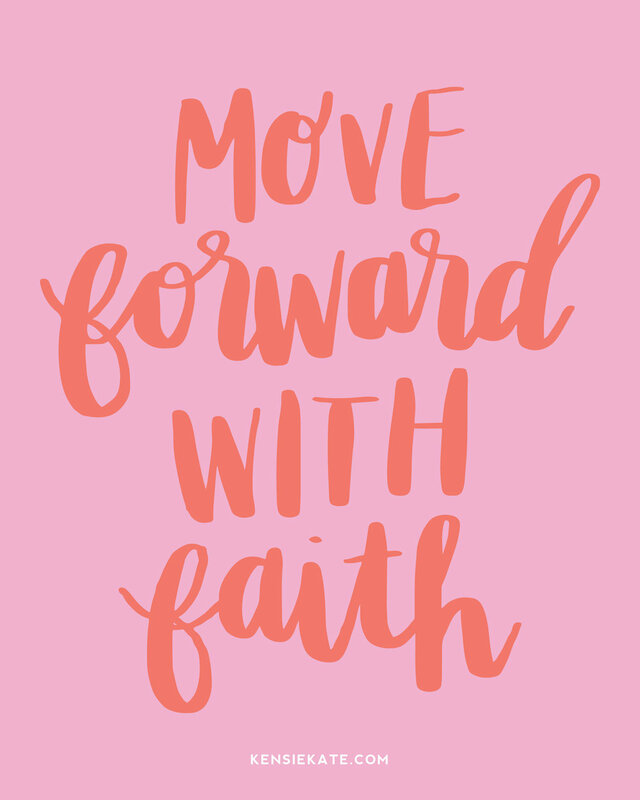 Awhile ago, I felt prompted to start a project that I have come to call "Women With Faith." I was looking for a way to make using social media a more uplifting experience and also spotlight some individuals who have inspired me with what they choose to share. I loved working on this project because it caused me to look for the good things on social media. This project was started in memory of my friend Marissa, who always made you feel better as a result of being around her. 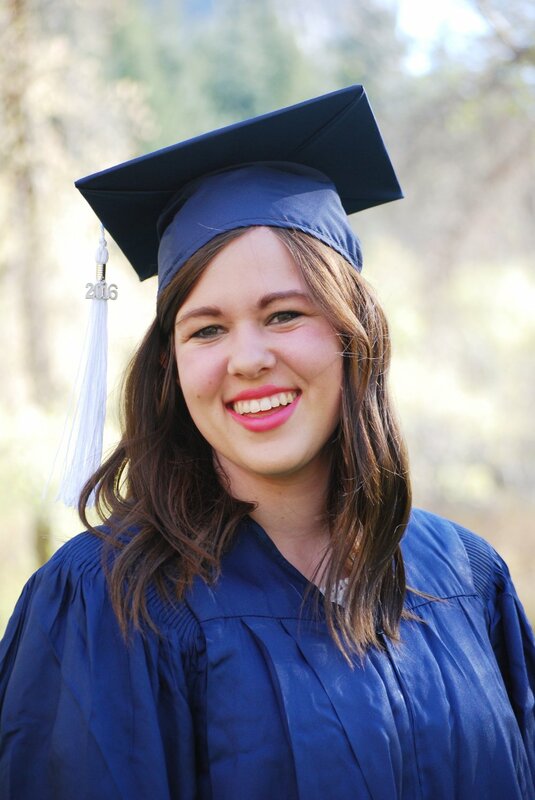 She had an incredible ability to love everyone as a child of God and see their potential. I've already shared these images on Instagram, but I wanted a place to keep them together. Who are the people who have inspired you on social media?